Will Sri Lanka make the most of the first of the two dead rubbers? Sri Lanka’s hopes were raised after their unlikely 2-0 victory in the Tests over South Africa last month. The five-match ODI series followed and the normal suit has continued for the visitors in this format. Sri Lanka have lost the first three matches to already lose series and now are left with pride to play for in the two dead rubbers. 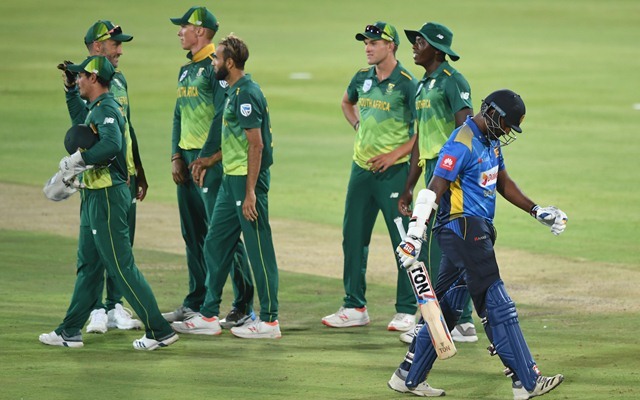 A remarkable improvement is needed for Sri Lanka’s ODI outfit and they have everything to play for in the fourth game of the series. With Kusal Perera injured and ruled out of the series, they have been hamstrung even further. But expect Sri Lanka to play freely now and such attitude is dangerous sometimes for the opposition. South Africa, on the other hand, have been extremely clinical thus far and would be rather sad that they haven’t been tested enough. They have made a few changes to their line-up for the last two ODIs and are keen on experimenting keeping the World Cup in mind. The experienced Hashim Amla and JP Duminy are back in the squad and they might get an opportunity. The average score of 234 batting first suggests that the pitch is on the slower side generally at the St. George’s Park in Port Elizabeth. As far as the temperatures are concerned, it will hover around 23-25 Degrees Celsius during the match and no rain is predicted. South Africa are certain to make a few changes. Aiden Markram has shown some great form in the domestic circuit and should comeback to open the innings alongside Quinton de Kock. Faf du Plessis looks settled at number three while Rassie van der Dussen might get more chances. JP Duminy adds depth to the batting line-up with David Miller to follow as well. Du Plessis confirmed more opportunities to Anrich Nortje which means Dale Steyn will have to wait in the wings. Probable XI: Quinton de Kock (wk), Aiden Markram, Faf du Plessis (c), Rassie van der Dussen, JP Duminy, David Miller, Dwaine Pretorious, Kagiso Rabada, Lungi Ngidi, Anrich Nortje, Imran Tahir. Sri Lanka do not have much to tinker with. Kusal Perera’s injury is likely to pave the way for Dhananjaya de Silva’s comeback into the side. Avishka Fernando and Oshada Fernando should start performing now with World Cup not far away. The skipper Lasith Malinga has to worry about his own form as well while Isuru Udana is the other pacer. Kamindu Mendis is an exciting prospect and Akila Dananjaya will lead the spin bowling attack. Probable XI: Niroshan Dickwella (wk), Avishka Fernando, Oshada Fernando, Kusal Mendis, Dhananjaya de Silva, Thisara Perera, Kamindu Mendis, Akila Dhananjaya, Lasith Malinga (c), Isuru Udada, Kasun Rajitha/Vishwa Fernando. 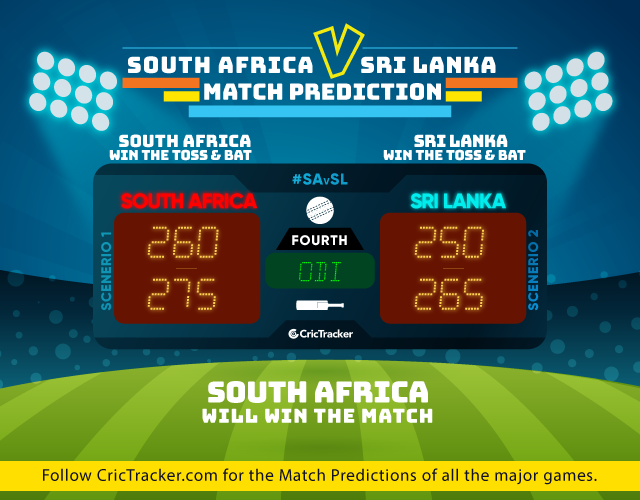 The prediction is for South Africa to continue their utter dominance on the visitors.